Featuring the highest strength possible, industrial doors are ideal for factories, warehouses, retail spaces and the like. For the type of strong, secure door you need, turn to Crawford and Brinkman Window & Door Company. We specialize in industrial door repair and commercial garage door installation. Plus, if you need repair or replacement of your dock equipment, overhead doors or gate operators, we can help with those too. 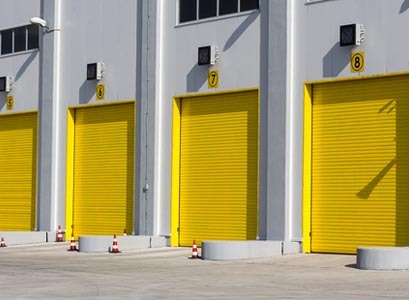 Punctuated by fast and friendly service as well as free estimates, we are proud to be your leader in Bloomington for industrial doors of all kinds. In fact, we have been offering quality service to business owners for more than 60 years. Rely on our skilled, professional installers, who all happen to be our own employees — not sub-contractors. If you are in need of rolling steel doors or electric garage door openers, along with all the hardware accents required, we can help you. Crawford and Brinkman installs the industrial doors Bloomington IL wants for security. Trust us for quality service on industrial doors throughout Bloomington, Peoria, Pekin, Morton and surrounding areas. You need to rely on secure, safe, strong doors for your business. We can make it happen. When you want the best industrial doors in Bloomington IL at competitive prices, choose Crawford and Brinkman. Contact us now at 309-740-1014 or email us at info@crawfordandbrinkman.com. You will find us at 715 N. Crestline Drive in nearby Peoria.